Meredith and Izzie take up knitting. Derek operates on Andrew, a spelling bee champ with a serious head injury. Bailey gets in on Andrew’s surgery because she’s worried that her coworkers won’t recognize her Nazi-status now that she’s a mother. Addison’s patient has an unborn baby with medical issues. After Alex fails to bite his tongue when a terminal patient routinely lies to her daughter about her health he gets a lesson in bedside manners from Burke. George also begins to overstay his welcome at Burke’s apartment after Callie visits him. Meredith has more confusing and uncomfortable encounters with members of her family. One of the female doctors meets a veterinarian named Finn. Izzie flirts with Denny and they play more naughty-Scrabble. 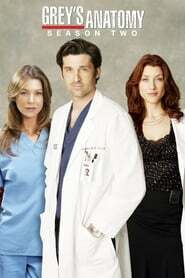 Meredith, Derek, and Addison sarcastically take another small stab at their friendships.